Nearly one in five (18%) internet users posted their thoughts, comments or questions about the campaign on an online forum such as a blog or social networking site. Fully 45% of internet users went online to watch a video related to the campaign. One in three internet users forwarded political content to others. Indeed, the sharing of political content (whether writing and commentary or audio and video clips) increased notably over the course of the 2008 election cycle. While young adults led the way in many political activities, seniors were highly engaged in forwarding political content to their friends and family members. Young voters continued to engage heavily in the political debate on social networking sites. Fully 83% of those age 18-24 have a social networking profile, and two-thirds of young profile owners took part in some form of political activity on these sites in 2008. Additionally, online political news consumers are delving deeply into the long tail of online political content–nearly half of online political news consumers visited five or more distinct types of online news sites this election cycle. However, this deeper involvement may change the way voters view online news content. Voters are increasingly moving away from news sites with no point of view, and towards sites that match their own political viewpoints–and this is especially true of those who delve deepest into the world of online political content. In the long run, it’s a safe historical bet that Bush will prove more polarizing than Obama because he was such an abject failure in the job–I doubt we’ll ever see Obama submerge to approval ratings in the mid-20s, or launch wars peremptorily without cause or purpose. The constant sniping from Rove, Wehner and the others during Obama’s first 100 days is a deeply neurotic reaction to the enormity of their own cockups in office. It shows a profound lack of class or grace, but then, that’s no surprise with these guys, is it? They ran the country like thugs, and thugs they remain. I don’t think it has sunk in for many conservatives that, while they might have had a narrow majority in what was essentially a 50:50 nation in 1980, their views now represent a shrinking minority. Sure, they might dislike Obama (primarily for imaginary reasons) even more than everyone else dislikes George Bush, but that is a poor measure of polarization. Conservatives often had an exaggerated impression of their support, such as with their talk of the “silent majority” going back to the Nixon years. They see the country as divided between Republicans/conservatives and Democrats/liberals and believe that at worse they have temporarily fallen a bit under 50% . Many think this is because they weren’t conservative enough. They don’t realize how repulsive the actions of George Bush were, not only to liberals but to moderates and conservatives with principles. Many of the current Democrats and liberals are people who voted Republican in the past while the Republicans are turning into an extremist regional party of the south and limited portions of the west. Conservatives are not doing themselves any favors if they hope to regain the majority by spreading their paranoid conspiracy theories about Obama. Rather than reducing Obama’s support they are only showing how unworthy of support from rational people the conservative movement has become. Texas came into the union with the ability to divide into five states, not withdraw. After seceding during the Civil War, Texas was allowed to re-enter the union after ratifying the 13th Amendment. The 13th Amendment banned slavery in the United States and any territory subject to its jurisdiction. UPDATED: Texas v White, a U.S. Supreme Court case decided in 1869, said Texas cannot secede. It’s a calm debunking of the last somewhat desperate argument by the anti-marriage equality advocates – that civil equality somehow destroys religious freedom. If anything, it seems to me, the public banning of civil marriage for gay couples itself privileges one religious conception of marriage against another. We forget how many people of faith support marriage equality. But we do not want to restrict the freedom of those who seek to champion heterosexual civil marriage; we merely seek an equal place at the table. And that is surely the core difference between those who favor marriage equality and those who oppose it. We see this as both-and; they see it as either-or. I love and revere heterosexual marriage and want it defended and celebrated alongside my own; they regard my civil marriage as an abomination to be banned and kept inferior to their own. I think that core difference is why we’re winning – because, in the end, Americans like to see freedom expanded, not curtailed, and they are adult enough and secure enough to live with those they disagree with. In an earlier post on health care costs I noted that decreasing health care spending will be difficult, and that spending more on health care is not necessarily bad. Mickey Kaus responds to Timothy Noah’s belief that health reform is needed due to health care costs spiraling out of control. This chart is also discussed by both. 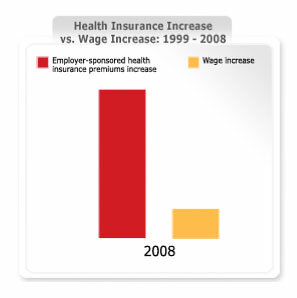 First, just because rising health care costs have eaten up all of the average American’s wage increases, it does not necessarily follow that either this rise was unwarranted or that health care costs need to be controlled. Maybe Americans, like richer people everywhere, want to spend more money on health care (as opposed to, say, newspapers) and advances in health care have given them more valuable services to purchase (or have their employers purchase for them). That’s probably not true–and almost certainly not 100% true–but you can’t tell it just by looking at Noah’s big graph. (Nor do I understand Robert Samuelson’s column, which seems to argue that because health care is not “material” it isn’t a valuable service and can’t be the basis for capitalistic economic growth.) If the graph showed that rising expenditures on computer technology had eaten up all the increase in Americans’ paychecks, would we immediately declare a “computer cost crisis” and demand that rising laptop expenditures be constrained? Or would we say, “Hey, people are spending a lot more on computers these days”? Second, the savings you get from the “public option”–savings on marketing and administrative costs, ability to use the massive purchasing power of the government to bid down prices–seem like one-shot propositions. We switch to a public plan, we save our 20-30 percent on administration and bargaining, and then the rise in health care costs resumes, thanks to ever-fancier technology and complex treatments (that actually are effective–just expensive). Soon costs have eaten up the 20-30 percent and are back on a rising path to consume a growing share of GDP, no? The lesson I would draw isn’t that we shouldn’t try to reform health care, or that we shouldn’t try to reduce costs. It’s that we shouldn’t reform health care in order to reduce costs, and that we shouldn’t expect health care reform to in itself control the health care entitlement problem that’s scheduled to devour the budget. We should reform health care to provide long life, security and peace of mind to Americans, while we resign ourselves to the likelihood that this will consume an ever-larger portion of our economy. Kaus is right on both points (which is not to say there is no room for any cost savings in health care). His comment on the one-shot decrease in cuts is based upon experience. We saw this with the move to HMO’s and other cost cutting efforts in the recent past. We got a one-shot decrease but health care costs continued to rise afterwards. None of these manipulations of the system change the underlying facts that we have an aging population and an increased amount of expensive technology which health consumers both want and benefit from. 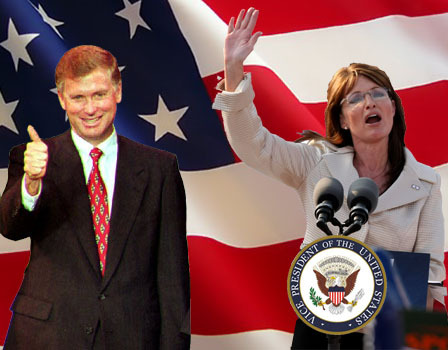 Is Sarah Palin Dan Quayle With Lipstick? Even before the 2008 election was over there was speculation about whether Sarah Palin would be a strong contender for the 2012 Republican nomination. I predicted she wouldn’t get any further than Dan Quayle, but she couldn’t entirely be counted out. Palin has a strong group of supporters, she has done well in early polls (which have little predictive value this far out), and the Republican Party has moved so far to the right that it is hard to rule out anything from them. Worse than Dan Quayle before her, Alaska Gov. Sarah Palin’s bright star has fast faded in the eyes of Washington Republican officials and analysts, calling into question her efforts to become a national party figure ready to run for the White House. “She’s just not ready for prime time,” said a party strategist who has worked for former President Bush. 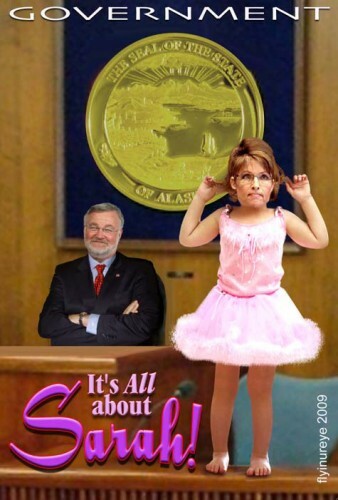 “I mean, she’s starting to look like she’s having trouble being governor of Alaska.” At issue is her weak debut, hampered by the mishandling of her by Sen. John McCain’s campaign, and subsequent family issues such as the most recent tiff with Levi Johnston, the father of her first grandchild and ex-fiancé of her daughter Bristol. 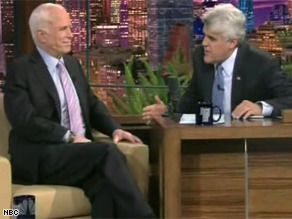 “We have, I’m happy to say, a lot of voices out there,” McCain told host Jay Leno before listing Louisiana Gov. Bobby Jindal, Minnesota Gov. Tim Pawlenty, Utah Gov. John Huntsman, former Massachusetts Gov. Mitt Romney, and Florida Gov. Charlie Crist. “There are a lot of governors out there who are young and dynamic,” said the Arizona senator. For those holding off on sending in their income tax returns until the last minute, here’s a quick reminder that, according to Harry Reid, paying income taxes is voluntary. Two libertarian bloggers have had a few posts on health care costs recently. Arnold Kling argues, and I agree, that Peter Orszag “makes it sound way too easy to control health care spending.” While there is undoubtedly waste as there is in any industry, most of the low lying fruit has been picked after years of various attempts at reducing health care costs (although I am always amazed that they are not doing more to crack down on all the fraud in medical equipment). I think he makes it sound way too easy to control health care spending. Let me give a semi-anecdote. My oldest daughter is in her mid-twenties. She has a friend the same age who was stricken with cancer last year. She was treated with chemotherapy, Initially, the doctors thought this had worked, but now the cancer is back. My guess is that her prospects at this point are rather frightening. That ends the anecdote. What follows is my imagination. Next, imagine that the best hope is a treatment that costs $100,000 and offers a chance of success of 1 in 200. Would I want her to get that treatment? Absolutely. But look at the issue from a rational, bureaucratic perspective. You have to treat 200 patients at a cost of $100,000 each in order to save one life, for a cost per life saved of $20 million. Is that what a rational bureaucracy would do? A rational bureaucracy would not even tell the family about this treatment option. But I think that in the American culture regarding medicine, I would find out about it. It’s worth noting that, at least anecdotally, the internet means we’re increasingly exporting our cost inflation to other countries. In the 1990s, breast cancer patients wouldn’t even have found out about a treatment like Herceptin. Now they fight (and win) public relations battles with their governments to get their treatments covered, even when the treatment is not deemed cost-effective by the health care regulator. And the woman who fought that famous and “inspirational” battle in Britain recently died; the drug didn’t buy her that much extra time, perhaps because she had to fight so long to get it. Practically, we have to pay healthcare workers a lot because we have to pay everyone a lot; in a rich country, wages for healthcare workers are high. And measuring healthcare productivity is really insanely difficult, which makes it very hard to figure out what’s worth spending money on. As long as Americans don’t want to sacrifice access to procedures–and they don’t–there’s just not much room for decreasing costs. That doesn’t bother me that much. The mindless trend extrapolation about how much we’ll spend on health care in the future elides the point that we’ll be much richer in the future; why shouldn’t we spend all that extra income on healthcare? Your ancestors spent 2/3 of their daily income on food. Now you spend about 15-20%. But spending much more of your income on clothes and housing doesn’t mean that you’re starving; it means that you’re so rich, you only spend a small fraction of your income on food. When I look around at our incredibly bountiful economy, I don’t see any obvious lack that we’re creating by spending ever more of our income on leading longer, healthier lives. Businesses and individuals struggling to pay for health care coverage might not agree that we are not creating any problems by our spending, but her point is a valid one. We continue to spend more on health care because not only do Americans want the best health care available, they want it without restrictions or waiting. Add to that ever increasing technology and an aging population, and it is hard to see any significant reductions on health care spending which will be acceptable in this country. Update: More along these lines from Mickey Kaus.